Conservative Firebrand Challenges Texas GOP Sen. John Cornyn : It's All Politics The No. 2 Republican in the Senate is the latest GOP incumbent to receive a challenge from the right. In a surprise move, Rep. Steve Stockman, who has a knack for stirring controversy, entered the 2014 Senate race Monday just before the state's filing deadline. Texas Rep. Steve Stockman participates in a mock swearing-in ceremony with House Speaker John Boehner in January. Stockman made the surprise move to challenge Sen. John Cornyn in the 2014 Texas GOP primary. Another day, another GOP primary fight. This time, it's John Cornyn of Texas, the No. 2 Republican in the Senate, who's receiving a challenge from the right in 2014. 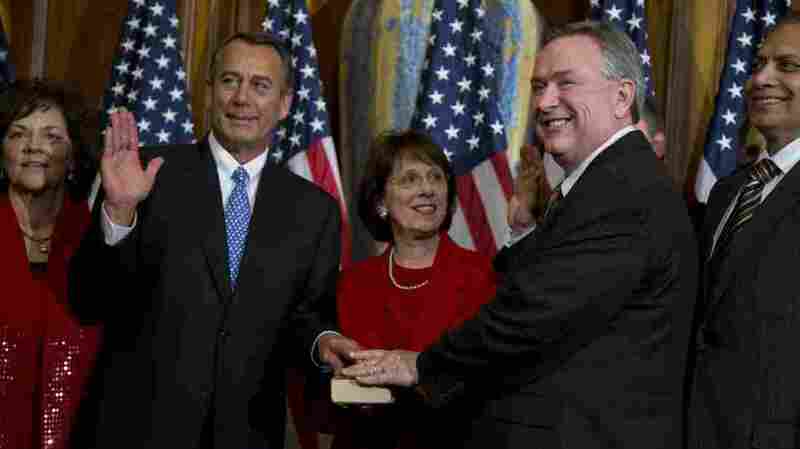 Rep. Steve Stockman, a conservative firebrand, made the surprise move to enter the March 4 race Monday evening just before the state's filing deadline. The Lone Star State is now poised to become the latest battleground — and the first Senate test — in the ongoing civil war between the Republican Party's establishment and Tea Party wings. Six other GOP senators, including Minority Leader Mitch McConnell, are facing reasonably competitive primary challengers next year. But the race in Texas is the only one where a GOP congressman is taking on an incumbent senator. Stockman is no insider. After serving in the House for a single, controversy-filled term in the mid-1990s, he was returned to Congress in 2012 to represent the newly created 36th District in East Texas. In his second tour, Stockman has picked up where he left off. He has called for President Obama's impeachment, compared him to former Iraqi dictator Saddam Hussein and established a brash Twitter presence. More recently, he came under fire for not properly disclosing his financial information. Stockman's bid against Cornyn, who's seeking a third term, appears to be a fairly steep uphill climb. For starters, his fundraising hasn't been up to par for a statewide hopeful: At the end of September, his campaign had just $32,000 on hand and was $163,000 in debt. Cornyn, on the other hand, had nearly $7 million in his campaign coffers and no debt. Stockman's hopes will depend on his grass-roots support, and he'll likely need some assistance from influential conservative outside groups — the kind that have already backed primary challengers to veteran GOP senators elsewhere this year. One of those organizations, the Club for Growth, released a statement Tuesday saying it would not get involved in the Texas primary battle. The Tea Party-aligned Senate Conservatives Fund, which has expressed dissatisfaction with Cornyn in the past, and the Madison Project have yet to announce their plans. Another factor working against Stockman: time. Texas scheduled its primary for the first week of March, making it the first Senate contest of 2014. That means he has less than three months to organize a campaign infrastructure, raise a hefty amount of cash and make his name known statewide. But Stockman's campaign may have the Tea Party faithful thinking back to Sen. Ted Cruz's rise in 2012, when he earned conservative grass-roots support and defeated the favored establishment candidate in the GOP primary. For his part, Cruz has declined to back Cornyn's re-election effort.